Original Editors - Beth Lee from Bellarmine University's Pathophysiology of Complex Patient Problems project. Clinical signs are widespread and affect numerous body systems. With early onset of the disease signs may be indistinct and go undetected such as general fatigue, slight weight gain from fluid retention and decreased metabolism, dry skin, or cold sensitivity. Elderly patients have significantly fewer symptoms than do younger adults, and complaints are often subtle. Many elderly patients with hypothyroidism present with nonspecific geriatric symptoms like confusion, falling, incontinence, and decreased mobility. With progression, clinical signs become more obvious and severe. Myxedema usually appears in the later stages if not treated resulting in nonpitting edema present around the eyes, hands, and feet. Myxedema may also cause thickening of the tongue and tissues of the larynx and pharynx, slurred speech and hoarseness. Synthetic hormone replacement therapy is the most common method of treatment for hypothyroidism. Artificial L4 hormone also known as L-thyroxine is used alone or in conjunction with a L3 hormone called liothyronine to supplement the deficient amounts of thyroid hormone that the thyroid is distributing throughout the body. Also, dehydrated animal thyroid hormone L-thyroxine may be used as another preferred method of hormone replacement. The hormone replacement is started at a low dose and then is gradually increased until a proper level is achieved and maintained. This is especially true for the elderly population who may have heart co morbidities because this drug therapy can create temporary levels of hyperthyroidism for several hours and increases the risk for cardiac events. When the body senses that there is a decreased amount of thyroid hormone being produced the anterior pituitary gland increases the amount of thyroid-stimulating hormone (TSH) being released in an effort to promote thyroid hormone production. With Hypothyroidism, the thyroid gland does not respond properly to the TSH so the pituitary gland continues to increase its secretion causing elevated levels of TSH to be present in the blood. Primary Hypothyroidism is caused by hormone insufficiency related to the loss of productive thyroid tissue or defective hormone production. The most common cause for the development of Primary Hypothyroidism in the United States is autoimmune diseases, in particular, Hashimoto’s Thyroiditis. With this disease the body’s immune system attacks the thyroid gland cells and enzymes in attempt to rid the body of invasion. This destroys the thyroid cells and leaves the gland with little ability to make the thyroid hormone. 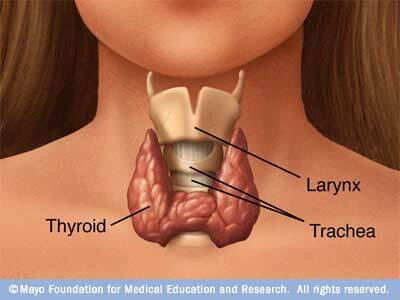 Primary Hypothyroidism may also be caused by radiation treatment or surgical removal of thyroid. This may be present in people treated for goiters, hyperthyroidism, Hodgkin’s disease, lymphoma, Grave’s disease or cancer of the head, neck, or thyroid gland. Some medicines such as amiodarone, lithium, interferon alpha, and interleukin-2 can prevent the thyroid gland from being able to make the thyroid hormone normally and can be another cause for Primary Hypothyroidism. These drugs usually only cause hypothyroidism in people with a higher genetic disposition to autoimmune diseases. Rarely, primary hypothyroidism is congenital, or present at birth, or caused by deficient iodine intake in the diet. Secondary Hypothyroidism is caused by pathology to the pituitary gland or hypothalamic disease which causes under stimulation to the thyroid gland secondary to inadequate amounts of TSH released to be utilized to make the thyroid hormone. *Slowed Mental function may include signs such as loss of interest or decreased short term memory. ** Poor Peripheral Circulation may demonstrate as skin pallor, intolerance to cold, cool skin, or hypertension. 4D: Impaired Joint Mobility, Motor Function, Muscle Performance, and Range of Motion Associated with Connective Tissue Dysfunction. 4E: Impaired Joint Mobility, Motor Function, Muscle Performance and Range of Motion Associated with Localized Inflammation. 6B: Impaired Aerobic Capacity/Endurance Associated with Deconditioning. 7A: Primary Prevention/Risk Reduction for Integumentary Disorders. When myedematous hypothyroidism is treated it may cause the patient to develop pseudogout in the joints and may affect the spine as well. Pseudogout may cause crystals to be deposited into the ligamentum flavum and OA ligament causing spinal stenosis and other neurologic issues. The physical therapist’s role is like that when treating rheumatoid arthritis. The patient may have complaints of muscle aches, pain, or stiffness and may cause the development of trigger points. This will require hormone therapy to resolve the symptoms and cannot be helped with simple myofascial release. The therapist working with a patient with hypothyroidism in the acute care setting must be aware that dry, edematous skin is prone to breakdown or tears. Prevention may be a key goal for the therapist to keep in mind and should work to monitor and relieve pressure points on the sacrum, coccyx, elbows and heels whenever necessary. The therapist working in the outpatient setting must be aware that patients with hypothyroidism present with a multitude of varying symptoms that mimic musculoskeletal or neural disorders. When treating a patient with widespread muscle weakness, general fatigue, widespread trigger points, or overall decreased deep tendon reflexes it is important to take an in-depth history so that all symptoms can be reported, because the patient may not be able to connect symptoms to one another. Also, in cases of patient reported carpal tunnel it is important to get a thorough history to understand if the mechanism of injury is truly related to causes treatable by the therapist such as ergonomics or if the patient needs to be referred on so that the underlying issue may be resolved. [Impact of thyroid function on the result of intrauterine insemination among fertile women]. Gestational caffeine exposure acts as a fetal thyroid-cytokine disruptor by activating caspase-3/BAX/Bcl-2/Cox2/NF-κB at ED 20. ↑ 1.0 1.1 Goodman C, Snyder T. Differential Diagnosis for Physical Therapists: Screening for Referral. St. Louis, Missouri: Saunders Elsevier, 2007. ↑ 2.0 2.1 2.2 2.3 2.4 2.5 2.6 2.7 Goodman C, Fuller K. Pathology: Implications for the Physical Therapist. St. Louis, Missouri: Saunders Elsevier; 2009. ↑ 3.0 3.1 3.2 3.3 3.4 3.5 Porter R, Hypothyroidism. The Merck Manual Online Medical Library. 2008. Available at: http://www.merck.com/mmpe/index.html . Accessed February 17, 2010. ↑ 4.0 4.1 4.2 4.3 4.4 4.5 4.6 Goodman C, Snyder T. Differential Diagnosis for Physical Therapists: Screening for Referral. St. Louis, Missouri: Saunders Elsevier, 2007. ↑ 5.0 5.1 5.2 5.3 Allahabadia A., Razvi S., Abraham P., Franklyn . 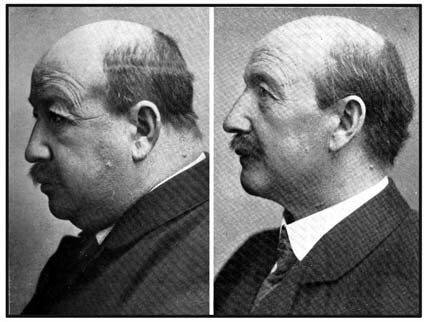 Diagnosis and treatment of primary hypothyroidism. British Medical Journal (International Edition) [serial online]. 2009;338:1090. Available from: Health Module. Accessed February 19, 2010, Document ID: 1731734701. ↑ Types of Hypothyroidism. Available at: http://www.type2hypothyroidism.com/Type1VsType2.html. Accessed February 17. 2010. ↑ 7.0 7.1 7.2 Vaidya B., Pearce S.. Management of hypothyroidism in adults. British Medical Journal (International Edition) [serial online]. 2008;337:284. Available from: Health Module. Accessed February 19, 2010, Document ID: 1542959701. ↑ Sell.com Classified. 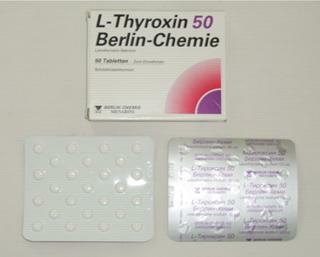 L-thyroxine. Available at: http://www.sell.com/23C4FX. Accessed on: February 17, 2010. ↑ Goodman C, Snyder T. Differential Diagnosis for Physical Therapists: Screening for Referral. St. Louis, Missouri: Saunders Elsevier, 2007. ↑ Goodman C, Fuller K. Pathology: Implications for the Physical Therapist. St. Louis, Missouri: Saunders Elsevier; 2009. ↑ 11.0 11.1 American Thyroid Association. Patient Resources Online.2009. Available at: http://thyroid.org/patients/patients.html . Accessed February 17,2010. ↑ Villar HC, Saconato H, Valente O, Atallah AN. Thyroid hormone replacement for subclinical hypothyroidism. Cochrane Database Syst Rev 2007;(3):CD003419. ↑ Bolk N, Visser TJ, Kalsbeek A, van Domburg RT, Berghout A. Effects of evening vs morning thyroxine ingestion on serum thyroid hormone profiles in hypothyroid patients. Clin Endocrinol (Oxf) 2007;66:43-8. ↑ Grozinsky-Glasberg S, Fraser A, Nahshoni E, Weizman A, Leibovici L. Thyroxine-triiodothyronine combination therapy versus thyroxine monotherapy for clinical hypothyroidism: meta-analysis of randomized controlled trials. J Clin Endocrinol Metab 2006;91:2592-9. ↑ Somwaru LL, Arnold AM, Joshi N, Fried LP, Cappola AR. High frequency of and factors associated with thyroid hormone over-replacement and under-replacement in men and women aged 65 and over. J Clin Endocrinol Metab 2009;94:1342-5. ↑ Persson E., Chapados I.. An Unusual Cause of Primary Amenorrhea. Clinical Pediatrics [serial online]. 2008;47:309. Available from: Health Module. Accessed February 19, 2010, Document ID: 1455542621. ↑ Tammy J Bungard, Mary Hurlburt. Management of hypothyroidism during pregnancy. Canadian Medical Association. Journal [serial online]. 2007;176:1077-8. Available from: ProQuest Medical Library. Accessed February 19, 2010, Document ID: 1260001101. ↑ H U Rehman, T A Bajwa. Newly diagnosed hypothyroidism. British Medical Journal (International Edition) [serial online]. 2004;329:1271. Available from: Health Module. Accessed February 19, 2010, Document ID: 758626471. ↑ Robert Topp, Jessica Sobolewski, Debra Boardley, Amy L Morgan, et al. Rehabilitation of a functionally limited, chronically ill older adult: A case study. Rehabilitation Nursing [serial online]. 2003;28:154-8. Available from: ProQuest Medical Library. Accessed February 19, 2010, Document ID: 417139371. ↑ S T M Krishnan, Z Philipose, G Rayman. Hypothyroidism mimicking intra-abdominal malignancy. British Medical Journal (International Edition) [serial online]. 2002;325:946-7. Available from: Health Module. Accessed February 19, 2010, Document ID: 234072331. ↑ M Selim, D A Drachman. Ataxia associated with Hashimoto's disease: Progressive non-familial adult onset cerebellar degeneration with autoimmune thyroiditis. Journal of Neurology, Neurosurgery and Psychiatry [serial online]. 2001;71:81-7. Available from: ProQuest Medical Library. Accessed February 19, 2010, Document ID: 75203187.